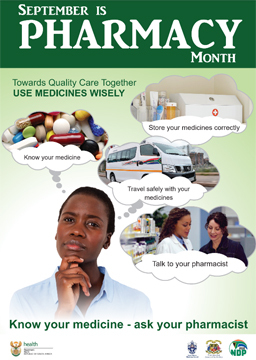 The National Department of Health (NDoH), together with South African Pharmacy Council (SAPC) and Pharmaceutical Society of South Africa (PSSA) is proud to announce the theme for Pharmacy Month 2018 – Use Medicines Wisely. Pharmacy Month is a unique opportunity to market the pharmacy profession across the country, bringing together pharmacists from all sectors to communicate the value that our profession brings in the provision of quality healthcare. This year’s theme of Use Medicines Wisely is aimed at educating the public regarding the importance of using medicine correctly to achieve quality healthcare results. There are five sub-themes to compliment the main theme: 1) Know your medicine; 2) Store your medicines correctly; 3) Travel safely with your medicines; and 4) Talk to your pharmacist. To highlight the important role that the pharmacist plays in health care system and to encourage communication between the public and pharmacists. Posters and pamphlets, developed by the National Department of Health, South African Pharmacy Council and Pharmaceutical Society of South African, consist of the main theme of Use Medicines Wisely with an image of a South African woman considering the sub-themes of the campaign - 1) Know your medicine; 2) Store your medicines correctly; 3) Travel safely with your medicines; and 4) Talk to your pharmacist. The posters and pamphlets will be printed and ready for distribution in August 2018 to public heathcare institutions. Artwork will be available for download from www.sapc.za.org, and www.pssa.org.za. This year, an evaluation of the effectiveness of the Pharmacy Month intervention will take place nationwide. Council urges anyone interested in participating in administering a survey for this exciting study to please contact Ruth Lancaster on ruth.lancaster@health.gov.za for further information. Council encourages pharmacists to tag and share social media messages sent on the Facebook pages of the NDoH, SAPC and PSSA, as well as to send short write-ups and images of Pharmacy Month interventions to Elmari.Venter@sapc.za.org, in order to be displayed in the e-Pharmaciae. PHARMACY MONTH 2018 - TOWARDS QUALITY CARE TOGETHER!